March | 2017 | The Journal of FA. Finding or getting the right dataset is painful process. Here’s an idea : let’s scrape images from search engine. 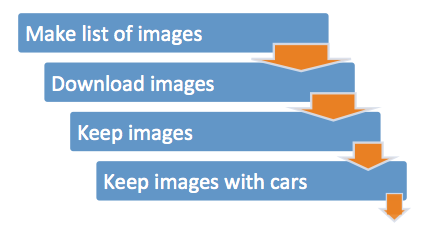 Combination of category and variations would pull series of queries to wrest images from search engine, before download an image from an url. Source code that scrape close to 1M of images overnight (I do not owned the code, however I think it is very useful). Really helpful to getting train sets for classifier. The pipeline of developing dataset. Original diagram by D Grossman. Read the details from the original post.